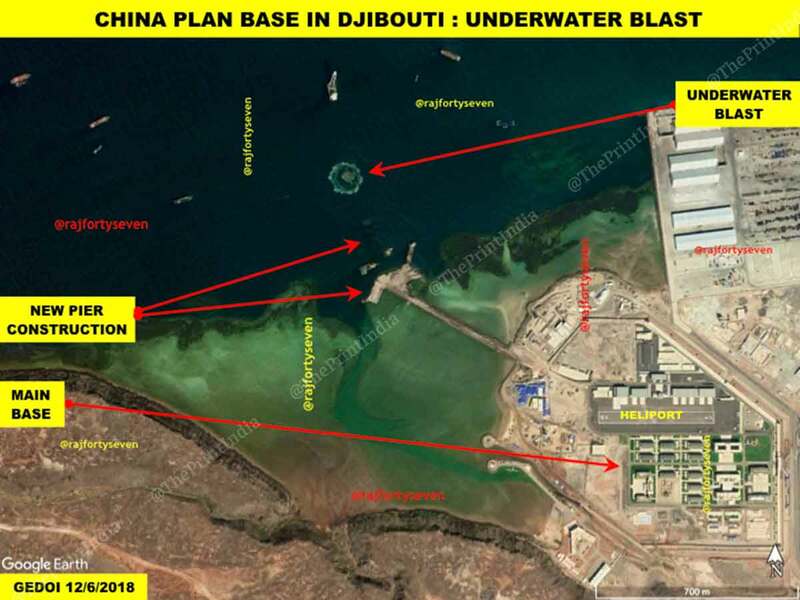 New Delhi: China’s first overseas military base, in the east African nation of Djibouti, is a mega fortress that has been in the works for some years now. The main base is now complete, with a heliport, ammunition depot and an automated chain supply system in place. But now, the People’s Liberation Army Navy (PLAN) is trying to build seven piers to the north-west of the base, with one to be exclusively used by the navy. In the process, it has conducted underwater blasts and possibly caused massive damage to the environment. Over the years, China has acquired a reputation for showing scant regard for the environment when it comes to construction and reclaiming land from the sea — especially in the way it has constructed artificial islands for military purposes in the South China Sea. 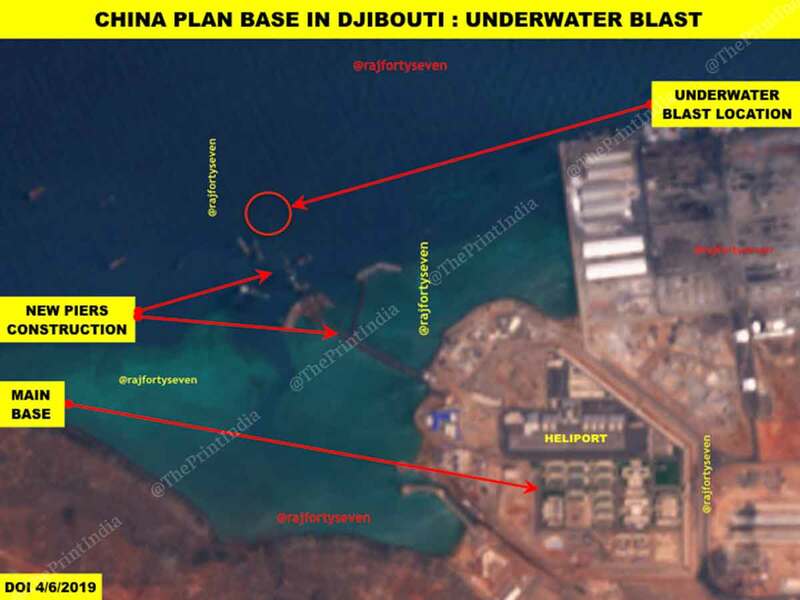 Satellite imagery accessed by ThePrint shows what China is up to in Djibouti and the Red Sea/Gulf of Aden region. The work to build the new piers began in May 2018, and continued at a very fast pace for almost a month. But then, it slowed down, possibly because of the sea and weather conditions in the area. Then, in September-October, the reclamation work gathered pace. Hectic activity of engineering trawls and ships has been observed since. New prefabricated blocks of 30m x 15m have been placed to further extend the pier. 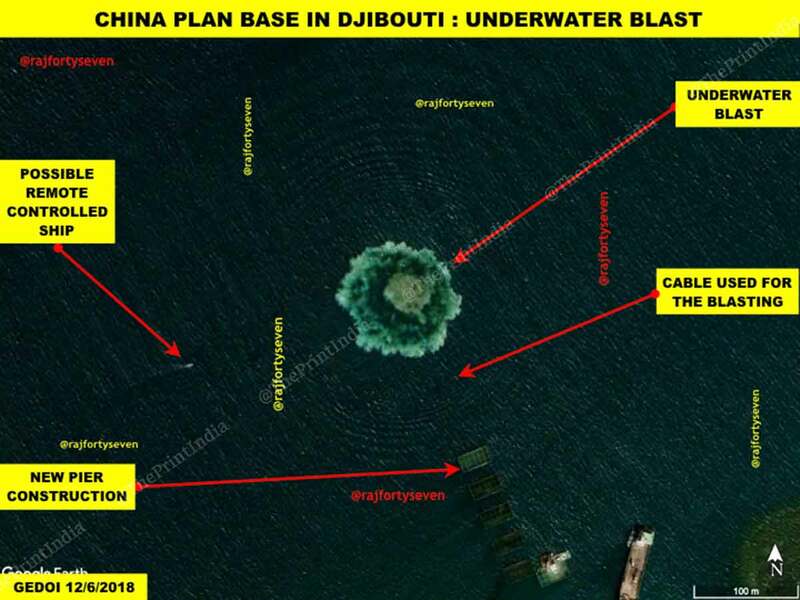 China seems to have gone against international conventions of responsible behaviour by using heavy and strong explosives to dig into the sea bed for the construction of the extended pier. The latest available satellite imagery clearly shows an underwater blast on 6 December 2018. The diameter of the blast is approximately 110m. The sea floor thrown is almost 40m in diameter. Ripples have been observed on the water surface up to 250m from the centre of the blast location. 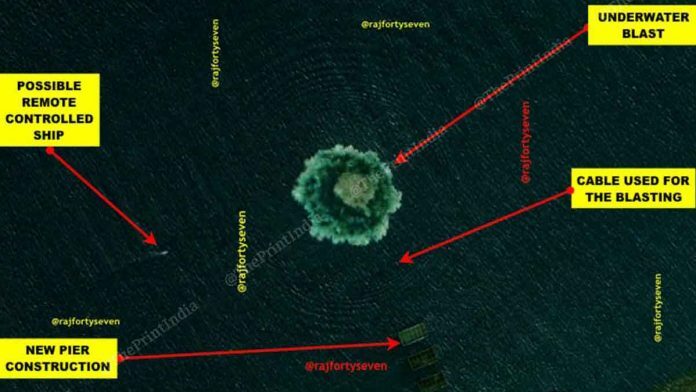 Such a huge underwater blast, visible on satellite imagery, indicates that a large number of blasts must be regularly carried out at this location. The high-intensity underwater blasts could pose serious danger to marine life in that area. Besides, they could also be dangerous for sea traffic, as the location is very close to the main sea lines of communications (SLOC) for civil and military vessels.